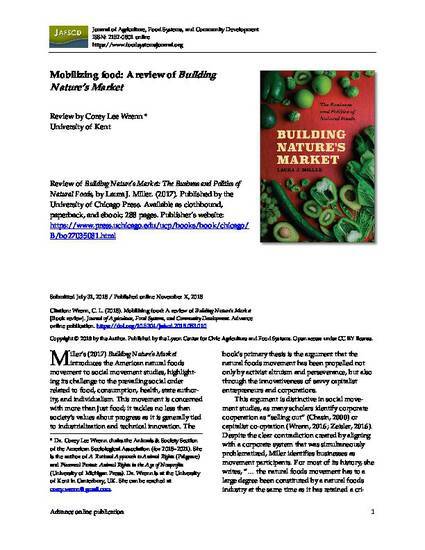 Miller’s (2017) Building Nature’s Market introduces the American natural foods movement to social movement studies, highlighting its challenge to the prevailing social order related to food, consumption, health, state authority, and individualism. This movement is concerned with more than just food; it tackles no less than society’s values about progress as it is generally tied to industrialization and technical innovation. The book’s primary thesis is the argument that the natural foods movement has been propelled not only by activist altruism and perseverance, but also through the innovativeness of savvy capitalist entrepreneurs and corporations. This argument is distinctive in social movement studies, as many scholars identify corporate cooperation as “selling out” (Chasin, 2000) or capitalist co-optation (Wrenn, 2016; Zeisler, 2016). Despite the clear contradiction created by aligning with a corporate system that was simultaneously problematized, Miller identifies businesses as movement participants.